On this day in 1945, a kamikaze pilot crashed onto the flight deck of the USS Enterprise (CV-6), inflicting damage that would keep her out of action for the remainder of World War 2. The USS Enterprise (affectionately known as “The Big E”) was a Yorktown class carrier and one of only three American carriers (along with the USS Saratoga and the USS Ranger) to survive World War 2. 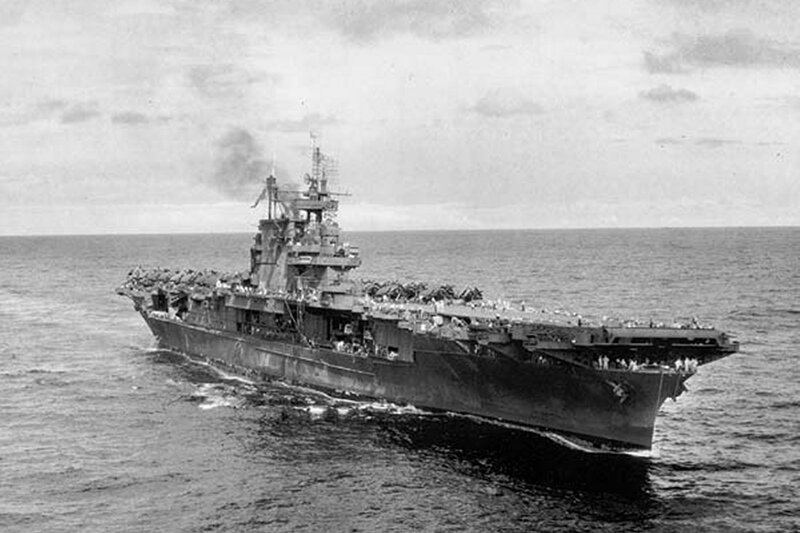 The Enterprise participated in more major battles against Japan than any other US warship, including the Battle Of Midway, the Battle Of The Eastern Solomons, The Battle Of The Santa Cruz Islands, various engagements during the Guadalcanal Campaign, the Battle Of The Philippine Sea and The Battle Of The Leyte Gulf. On three separate occasions, the Japanese announced they had sunk the Enterprise, earning her the nickname “The Grey Ghost”. She was the most decorated US ship of World War 2, earning 20 battle stars. The Enterprise was decommissioned on February 17, 1947. Initial plans to convert her into a memorial were suspended and the Enterprise was sold to the Lipsett Corporation for scrapping, which was completed in May, 1960. The ship’s bell resides at the US Naval Academy, where it is rung to celebrate midshipmen victories over West Point, the “Enterprise” nameplate from the ship’s stern is on display in River Vale, New Jersey and her commissioning plaque and one of her anchors are on display at the Washington Navy Yard in Washington, DC. A total of eight US Navy ships have borne the name Enterprise, with the most recent being CVN-65. CVN-65 was deactivated on December 1, 2012 and it was announced during her inactivation ceremony that the upcoming Gerald R. Ford-class carrier CVN-80 will be named Enterprise. The history of The Big E is far more detailed than I could easily tell in the confines of a website post. For more information, I’d highly recommend the excellent “Enterprise: America’s Fightingest Ship And The Men Who Help Win World War II” by Barrett Tillman.